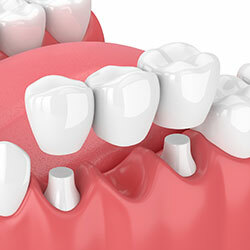 A bridge is an option to replace missing teeth, help maintain the shape of your face, or alleviate stress on your bite. A bridge replaces missing teeth with artificial teeth, looks great, and literally bridges the gap where one or more teeth may have been. Your bridge can be made from gold, porcelain, or a combination of these materials, and is bonded onto surrounding teeth for support. Ask Dr. Delaney or Dr. Colpitts if it is the best solution for you.